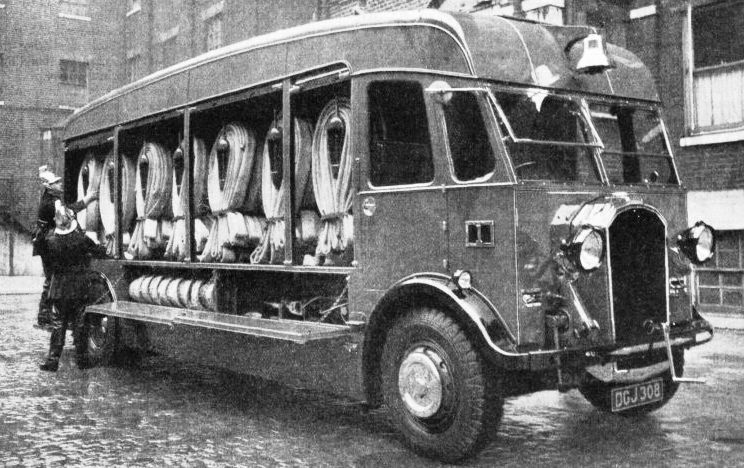 A SPECIAL HOSE VAN built for the London Fire Brigade carries more than a mile and a half of hose. The hose is taken from the back of the machine in two lines as the vehicle travels. Vans of this type are particularly useful for areas in which there may be a shortage of water. FIRE is one of man’s greatest friends and can be one of his greatest enemies. On land and sea the engineer combats the fire peril with two counter-measures: fire protection and fire extinction. The design of appliances used in either of these two methods calls for a high degree of engineering skill and resourcefulness. An essential point in fire engineering is the factor of time. Many of the protective appliances may never be used for the purpose for which they were devised, but they must be ready to operate the instant the emergency occurs, as the slightest delay in bringing them into operation may entail loss of life in addition to immense material damage. Fire is always a lurking danger liable to be released by accident, or carelessness. Spectacular as the work of the firemen at a big fire is, the real triumph of the fire engineer is the number of the fires that never happen. Much of the work of the fire engineer lies in providing new structures with means of protection when they are being built, and in equipping old and historic buildings with up-to-date protective appliances without spoiling or detracting from the architectural harmony of such buildings. Every building, new or old, entails individual problems which the fire engineer is called upon to solve. The problems of fire protection concern the supply of water available and its application, the position of fire mains and hydrants and the care and maintenance of the apparatus. The cost, of such protection is offset by the rebates which fire insurance companies allow on the premiums of buildings so protected. Then, again, the intrinsic value of an historic building cannot be covered by a cash value; so there is also the safeguarding of the priceless architectural heirlooms of a nation in addition to the protection of human life and public and private property. 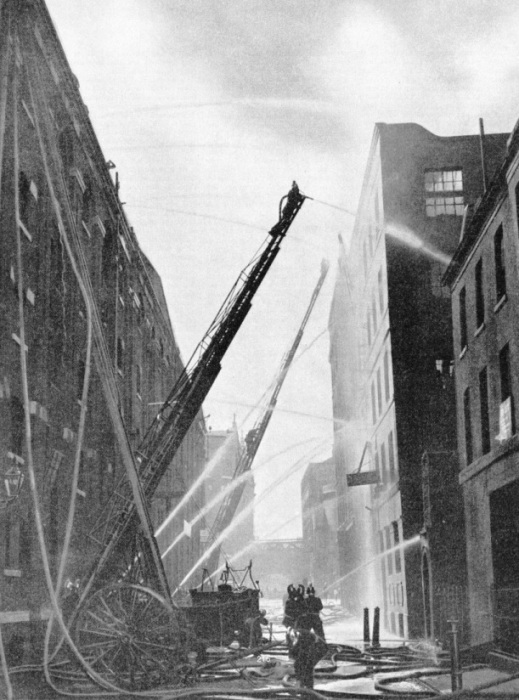 POWERFUL JETS OF WATER discharged from many hoses were played on a big fire in an oils and colours warehouse at Southwark, London, from extended ladders and other vantage points. Often there is no building opposite from which water can be directed into a blaze, and then the use of extended ladders is all-important. The tanks were removed and an electrically-driven pumping set was installed at a height of 60 feet. This pump takes water from the mains of the Metropolitan Water Board and delivers it into a ring main round the drum of the dome under the colonnade. Hydrants are fixed on this main at various points, each hydrant having hose and fittings. When one hydrant is opened the pumps start automatically, so that a fire can be attacked at roof level without any delay caused by any one having to go to the pump and start it. By closing the hydrant the electric current is cut off and the pump is stopped. Some large buildings in London are independent of the water supplies of the Metropolitan Water Board. Among them is Lloyds Bank, at the corner of Pall Mall and Regent Street. In this building is an artesian well from which water is pumped to a large tank below the level of the basement. Two electric pumps deliver water from the tank for domestic and fire protection services. Rising mains are carried upwards in the lift shafts, and at each floor is a hydrant, with a length of hose sufficient to reach any point on that floor level. Immediately a hydrant is opened the pumps start to work automatically. To bring the pumps into action there is a device above the level of the root. This device consists of a tank connected with the fire main service and fitted with an electrical float-switch. When a hydrant is opened the level of the water in the tank falls. The float falls with it, and in so doing turns a switch which starts the main control gear for operating the pumps. Either of the pumps delivers 300 gallons of water a minute at sufficient pressure to enable a powerful jet to be projected at the level of the roof, where two separate hydrants are fitted. Another phase of fire protection is concerned with narrow thoroughfares which cannot be reached by a fire engine. An example is the Burlington Arcade, a narrow, covered thoroughfare which connects the north side of Piccadilly with Burlington Street, London. A high-pressure fire main is carried through the arcade below the pavement. The main has three underground hydrants. Close to each hydrant is a wall cupboard which houses hose and branch pipe. Chemical fire extinguishers are placed near each cupboard and elsewhere. In buildings where there are hydraulic power mains which supply water at a pressure of about 700 lb to operate lifts and other machinery, advantage is taken by the fire engineer of the pressure mains. Hydrants which reduce the pressure instead of increasing it are fixed to the hydraulic main. Automatic alarms and sprinklers, or a combination of both, are other fire protection devices used in buildings. The automatic sprinkler comprises a system of water pipes ending in sprinkler heads fixed in the ceilings of rooms. If fire breaks out unobserved in a room the temperature increases. When it has reached a certain point it causes a metal fitting to expand, which closes an electric circuit. This opens the valve of the sprinkler, rings the fire alarm and also indicates on an instrument board at a remote point the number of the room. Other types of sprinkler make use of low fusing-point alloys. The sprinkler system is installed in large liners, for the work of the fire engineer is not confined to the land. Fire at sea is so terrible that every provision is made to prevent it. Afloat or ashore a sprinkler is of value in giving prompt action and preventing a small outbreak from developing into a huge fire. In a ship the problem of instant detection of fire is complicated by the fact that the holds and other parts of the vessel are not easily accessible. To overcome this the air can be led to the bridge from enclosed parts of the ship so that, it fire occurs, the smoke or fumes give warning. 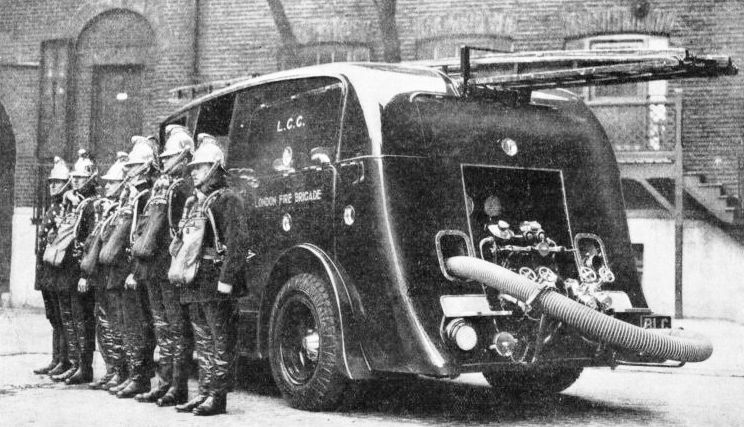 STREAMLINED MOTOR FIRE ENGINE of a type being used increasingly by London and provincial fire brigades. The engine is equipped with an extension ladder fitted on the roof and a first-aid pump situated at the back and operated by the motor. Water for this pump, which is used for first aid - that is, before other assistance arrives - is carried in a tank inside the van. Hose is carried in lockers on either side of the van. Fire hoses are placed in position in the vessel and these can be connected with pumps to enable water to be played on to the fire in a few moments. Fireproof doors, which can be closed from a control point on the bridge, localize an outbreak. Chemical and foam apparatus is installed to extinguish oil and other fires which cannot be put out by water, and non-inflammable gas and steam are pumped into a sealed hold to smother the flames. Celerity, efficiency and portability are the aims of the fire engineer who specializes in fire-extinguishing appliances for fire brigades. Among firms who make such appliances, Merryweather & Sons, Limited, have had a long association with large and important fire brigades. Appliances at a fire station in a city range from the simple but ingenious hook ladder to the motor-operated steel turntable ladder. There are powerful motor fire engines, hose vans and special vans for extinguishing fires at chemical works, in addition to vans containing breathing apparatus which firemen have to use to penetrate fume-laden buildings. The all-steel turntable ladder, which extends to a height of 100 feet and more, is a masterpiece of mechanical engineering, devised by fire engineers to tackle fires in tall buildings. 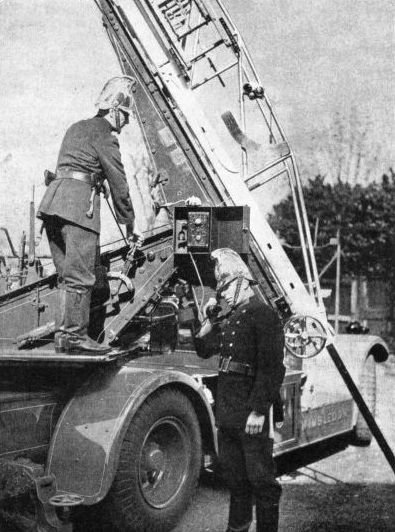 It is a beautifully balanced portable appliance consisting of an extending steel ladder in four sections, mounted on a turntable which, in turn, is mounted on the chassis of a motor fire engine. The motor drives the appliance to the scene of the fire, extends the ladder and pumps the water. The ladder does not rest against any wall or other support, but is balanced on its turntable and can be swivelled to any point of the compass and elevated at almost any angle from the near-horizontal to the vertical. The fireman stands on a platform and is raised with the hose as the ladder is extended. In action this is the most impressive of fire-fighting appliances. Extremely powerful, it is capable of such fine adjustment that the jet of water can be directed with great accuracy. A typical appliance of this type has a 100-feet ladder and a 550-gallons pump, and is powered by a 115-horse-power six-cylinder petrol engine. The sides of the four-sections ladder are of rolled sections welded into rectangular tubes, and the trussing rails are composed of steel tube. The mechanism of the ladder is operated through the intervention of friction clutches so that the ladder extends smoothly, an important point to the man who is being raised with it. The gears for raising, extending, revolving and lowering the four sections of the ladder are controlled by three hand levers, which are attached to the revolving portion of the turntable framing. A connexion is provided from the revolving platform to the engine throttle, operated by a foot pedal, so that the operator can control the speed of all movements of the ladder whatever the position of the turntable. A slow-speed reducing gear enables fine adjustments to be made after the ladder has been placed in approximately the most convenient position. Thus the ladder can be safely and accurately adjusted for elevation, for extension or for rotation when a fireman is at the top. The lowering of the ladder is controlled by an automatic brake which governs the lowering at all times and, by a multiple-plate clutch, holds the sections in position until the winding drum is rotated. Auxiliary gearing is provided for moving the ladder by hand if necessary. THE POWERFUL MOTOR EXTENDING LADDER used by the Wimbledon (London) Fire Brigade is made entirely of steel, and extends to a height of 70 feet. The ladder is fixed to a turntable mounted on a chassis and operated by power from the motor. Hand levers control the gears for raising, extending, lowering and revolving the ladder. A patent automatic safety control governs the extension and lowering at safety margin for various angles shown on the brass plate on the main ladder. Coloured lights indicate the relative position of the ladder rungs to the operator. Additional safety stops are also provided. Plumbing gear enables the ladder to be adjusted to a considerable angle on either side by a screw and hand wheel at the base of the main section. As the weight is considerable, four jacking-up screws are fixed to the chassis framing. These screws not only take the weight off the springs and tyres of the vehicle but also provide a large and secure base. 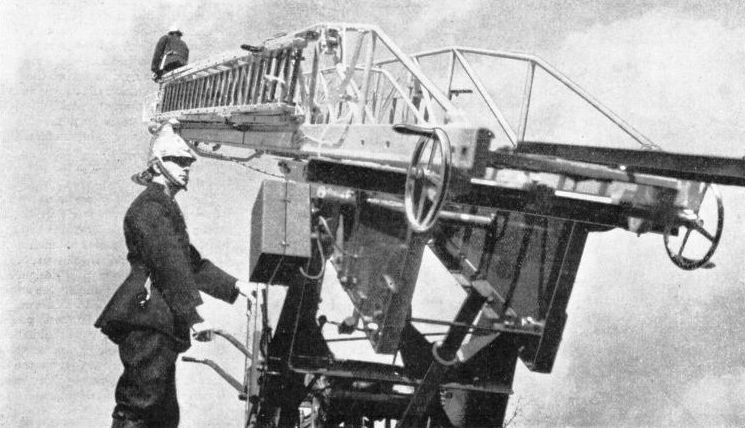 A double swivelling monitor nozzle is mounted on the ladder and the fireman at the top directs this with the minimum effort. Loudspeaker telephone apparatus, comprising transmitters and receivers at the top and bottom, provides communication and obviates any need of shouting. In contrast to a giant turntable - one at Hull, Yorks, extends to 150 feet - there is the trailer pump, which is a motor fire engine on two wheels. The trailer pump can be towed behind a lorry or a car, pulled by hand across fields or wheeled into alleys and narrow streets which are inaccessible to a full-size fire engine. The trailer pump is the fire engineer’s light artillery. Despite its handiness it is powerful, the four-cylinder motor developing 40 horse-power. This can deliver 275 gallons a minute at a pressure of 120 lb per square inch, 250 gallons at 150 lb and 200 gallons at 170 lb. This output makes the trailer a valuable auxiliary to larger fire engines, especially where water has to be pumped for a considerable distance. In the country, where water supplies are often inadequate or inaccessible, the trailer pump is invaluable. Sometimes a length of as much as 4,000 feet of hose is required to get the necessary water from a stream or a ditch to the scene of the fire. Except that it is not self-propelled as a vehicle, the trailer pump is a complete motor fire engine, mounted on a steel carriage. A hinged strut at the back and an adjustable support in the front provide a rigid base when the pump is working. Ignition of the engine is by high-tension magneto with impulse starter, and there is an auxiliary tank to enable the water to be run for a short period before the water pump is in operation. The water is used also to cool the engine. The pump has three single-acting barrels, the plungers of which are driven by a single crank, so that a constant flow of water is maintained during a complete revolution of the crankshaft. The pump is designed to give a high vacuum during the suction stroke to enable water to be drawn into the pump from the greatest possible depth. A by-pass valve is fitted between the suction and delivery passages, by which any quantity less than the full amount displaced by the plungers can be delivered. This enables the pump to work efficiently when the supply of water is small. Thus the trailer pump is extremely useful where no water mains are available. It can be used to pump water from a ditch or stream across country to a dam or pond to supply fire engines which cannot cross the fields and tap the water supply. At the same time it is a powerful fire engine. At a test on one occasion a trailer sent a compact jet of water ⅞-in in diameter to a height of 150 feet. Some large fire engines are now made with enclosed streamlined bodies, not because such a design is fashionable, but because it is efficient and affords full protection to the firemen. Some provincial fire brigades cover large areas and it is essential in winter that the crews arrive at the scene of the fire without having been exposed to the elements by a journey through sleet or snow. CONTROLS FOR EXTENSION LADDERS are situated on the turntable. Communication with the fireman at the top of the ladder is made by a special form of telephone which eliminates extraneous noise and obviates any need for shouting. It thus helps to ensure that instructions cannot be misunderstood. Lancaster Fire Brigade has a noteworthy example of the enclosed type of fire engine, powered by a 65-horse-power motor and equipped with an extension ladder and a first-aid apparatus. The expression first aid is applied by the fire engineer not to assistance for human beings, but to the extinction of fires. A substantial proportion of the fires to which fire engines are called are of a minor nature. Provided that the call is made promptly the beginning of what might be a serious outbreak can be quenched with comparative ease by what is called the first-aid apparatus. This consists of a water tank (carried on the fire engine), from which water is pumped on to the fire within a few seconds. A 40-gallons first-aid tank is carried on the streamlined fire engine. The 120 feet of hose for it are carried in a locker and paid out through a special porthole on either side of the body, the hose being led over rollers fitted to each porthole. The hose is run out at high speed, the engine operates the pump, and water from the first-aid tank is directed on to the seat of a small fire. If the fire is a large outbreak the mains are connected and the pump, capable of delivering 275 gallons of water a minute at a pressure of 170 lb, is brought into operation. This fire engine is equipped with a towing bar for drawing a trailer pump. An aperture in the back of the body enables a fireman to operate the line controlling the brake of the trailer pump. In a city such as London the fire engines are the most powerful pumps designed for operating with a magnificent system of hydrants and water supplies. Turbine pumps operated by 80 horse-power motors deliver 800 gallons of water at a pressure of 50 lb, 650 gallons at 100 lb, 550 gallons at 125 lb and 410 gallons at 150 lb. Here again everything is designed for efficiency. The officer in charge does not turn on the full force of all the means at his disposal, but looks first and decides whether it is not more economical to apply the first-aid apparatus. The indiscriminate use of large quantities of water may cause more damage by water than by fire, particularly if the outbreak occurs on an upper floor. The officer does not invoke a flood to drown a mouse. Figures convey little, and a 40-gallons first-aid tank does not sound much, but 40 gallons of water are a considerable quantity when directed into one room of a building and, efficiently and promptly applied, can extinguish a fire. In London the policy is to use a dual-purpose fire engine, which is a powerful pump and also carries a fire escape. These appliances carry either 50-feet or 40-feet extension ladders. In addition there are special vehicles. One of these carries a mile and a half of hose which can be laid out in one or two lines at the rate of fifteen miles an hour. Emergency tenders carry a generator to supply current for searchlights and clusters of lamps, self-contained breathing apparatus, oxygen reviving apparatus, oxyacetylene cutting plant, suction fans for extracting smoke, tools for dealing with lifts and jacks, hacksaws and crowbars. There are foam tenders for dealing with chemical fires and oil fires. There are three river floats, the most modern of which, the Massey Shaw, built in 1935, has eight branches and pumps which can operate simultaneously. The Massey Shaw is generally moored beside Blackfriars Bridge. An earlier motor fire float, the Beta III, built in 1926, has a paraffin oil engine of 120 horse-power, and pumps with a total capacity of 2,000 gallons a minute. She is generally moored at Cherry Garden Pier, Rotherhithe. The importance of fire precautions may be gathered from the fact that the cost of losses from fire in Great Britain and Ireland during 1935 was estimated at £9,205,000. The variety of the equipment indicates the versatility of the fire engineer which has provided the fireman with an appliance for every emergency. New industries and new methods of building have brought new problems and the fire engineer has to study them. The officers of the brigades are fire engineers who have specialized in subjects such as hydraulics, chemistry, electricity, the materials used in building construction and the effect upon them of heat and water, the storage of coal, hay, jute, cotton, oils, petrol and explosives. From time to time they meet to discuss the technical problems of their profession, and they have a chartered body, the Institution of Fire Engineers, with offices in London. RIVERSIDE FIRES in London often call upon the London County Council’s fire floats, of which there are three in service. Water from the Thames is pumped through a powerful jet. 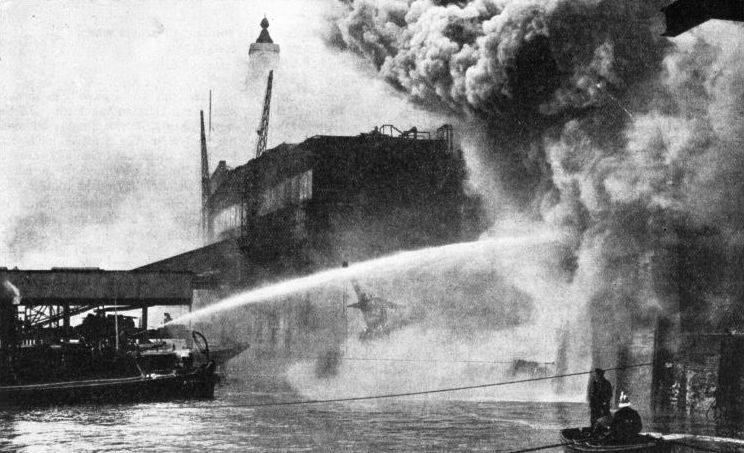 The float shown here fighting a blaze at a wharf below Waterloo Bridge was the Alpha II.